For example, providing medial calcaneal mobilizations/releases for the overpronator would be great if the patient has a compensated calcaneal varus. But if the patient has a compensated forefoot varus the medial mobilization/release would likely worsen their injury. It may sound complicated, but once you understand these 3 foot abnormalities and pathomechanics it will make sense. The foot can be simplified into a structure that has 2 jobs: mobility (pronation) and stability (supination). It requires adequate mobility to adapt to ground surfaces and facilitate shock-absorption. It requires stability to function as a rigid lever for efficient propulsion. Failure of either of these jobs will cause great dysfunction throughout the body. This stability and mobiilty is dependent on an intricate passive and dynamic system. The passive system of bone orientation and joint congruency help to provide static stability when aligned, and flexibility when not aligned. The dynamic system of the muscles help to reinforce stability and allow for controlled flexibility (eccentric loading). When there is an abnormality in the foot alignment or structural, the subtalor joint often compensates by altering the normal balance of stability and mobility. Treating the compensation may provide the patient relief. But for full resolution of the dysfunction you will need to correct and remove the cause. Normal neutral foot alignement is compromised of 3 things: 1) Neutral Subtalor Joint 2) Vertical Calcaeus (in line with lower leg) 3) Metatarsal Heads Perpendicular to neutral calcaneus/subtalor joint. This is the position for optimal functioning of both passive and dynamic systems. Postural assessments should be viewed from all angles. An anterior view will show any sagittal plane deviation (forefoot abduction). An oblique view will give a good assessment of the arch and navicular hight. A posterior view will display calcaneal and subtalor positions. Once you have a postural assessment, it is important to determine the foot alignment and structure. There are many ways to accomplish this. Finding talor neutral (anterior palpation), lower leg to rearfoot alignment, unbiased passive dorsiflexion, joint play, postural foot assessment, and gait analysis. I find it best to use a combination of these assessments. If you understand the possible types of pathomechanics and forefoot/rearfoot alignment it will make it easier to determine exactly which foot type your patient has. Finally, you want analyze their gait to see how the patient dynamically uses their foot alignment and structure. The static postural foot assessment will help give you an indication of what you should be looking for during the analysis. You want to not only look for over or under pronation, but try to assess for 3 specific aspects of the dysfunctional motion (compensation). This is of paramount importance because it is the compensations that will dictate which structures you need to treat. This is the most common foot abnormality. However, it may or may not be a clinical problem. Calcaneal/Rearfoot varus is when the calcaneas is inverted with the subtalor joint is in neutral and the forefoot is perpendicular to the lower leg. This foot abnormality is more supinated at heel strike. These patients often present with decreased lateral (eversion) subtalor joint play. Compnesations include overpronation or 1st ray plantarflexion to allow the medial forefoot to contact the ground. Abnormal compensatory pronation (amount & speed) will occur at heel strike and continue until heel rise. After the heel is off the ground the foot is able to supinate in time for a fairly normal propulsion. These patients differ from forefoot varus in that the calcaneus does not go into excessive valgus (eversion). This is the most destructive foot abnormality to the lower extremity. Because of this, it is the most clinically common pathomechanical abnormality. 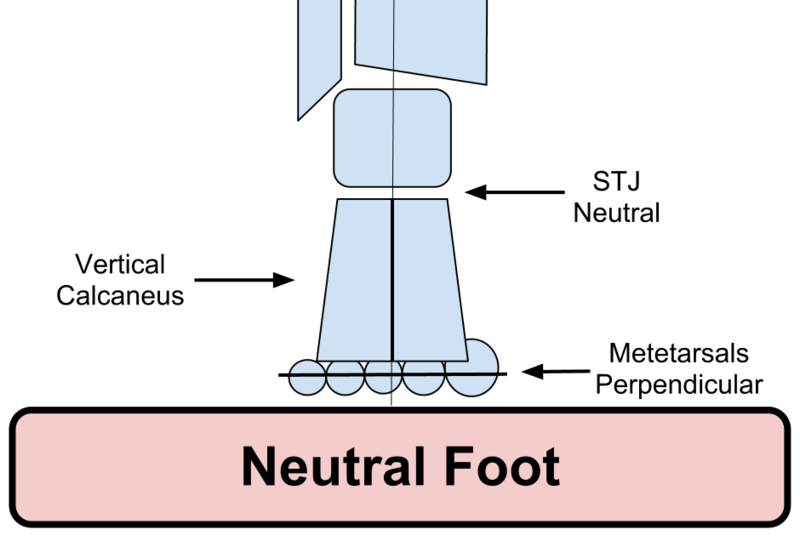 Forefoot varus is when the forefoot is inverted (big toe higher than 5th toe) while the subtalor joint and calcaneus are in neutral. This foot abnormality almost always causes over pronation. Joint play is often excessive. To allow for the inverted forefoot to contact the ground there is excessive compensatory pronation (amount & timing) beginning at the foot flat phase of the gait cycle. This continues for the rest of the stance phase, causing the patient to push-off with an unlocked pronated foot. This is a major clinical problem since push-off requires a rigid supinated foot to use as a lever for propulsion. These patients differ from calcaneus varus because they are not able to achieve any supination prior to push-off. This foot abnormality often presents in patients with rigid and supinated feet (unlike forefoot varus). Since they are already in a supinated posture they are at higher risk for inversion ankle sprains. Forefoot valgus is when the forefoot is everted while the calcaneus and subtalor joint are in neutral. The medial metatarsals lie below the calcaneus (plantar flexed in relation to the calcaneus). There are two different types: total valgus (all the toes slope down) or 1st ray plantarflexion. This foot type often presents with restricted joint play (midfoot, 1st ray, calcaneus). Since the metatarsals lie below the calcaneus it is nearly impossible not to compensate. The patient must supinate to accomodate this abnormality. This may lead to a calcaneal varus compensation. Excessive compensatory supination occurs (amount & timing) after heel strike due to premature loading of the forefoot. Pronation is insufficient, but may occur at the end of stance phase to allow for knee flexion. This foot abnormality has trouble attenuating loading forces, thus proximal joints are forced to accomodate. It is important to note that these abnormalities and pathomechanics are not black and white. They exist on a continuum and are often times combined. Being able to further assess your pronators and supinators into a specific pathomechanical foot type will improve your plan of care and allow you to provide your patients with specific interventions to fix the culprit of the problem. While this post focused specifically at the local foot and ankle joint, it’s important to consider regional interdependence. Remember that the height and rigidity of the arch can be affected by tibial internal and external rotation (in closed chain). And this tibial motion is further influenced by it’s proximal structures. Donatelli R. Abnormal Biomechanics of the Foot and Ankle. J Orthop Sports Phys Ther 1987;9(1):11-16. Clear and concise biomechanics of the foot.